Are you interested in starting a Preschool Business? Are You confused about startup options (Franchise/Co Branding/Own) and Investment? 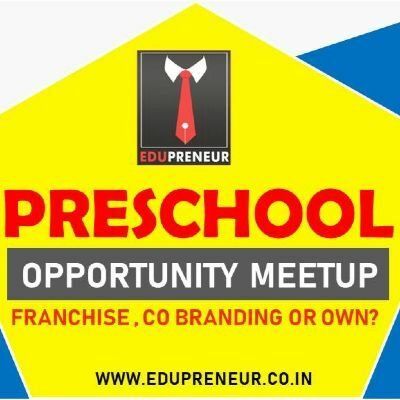 This one to one meetup is an initiative of Edupreneur Preschool Management compay to support micro & small startup entrpreneurs in starting a preschool business in low investment of Rs.1.0 Lakh in support of PM Mudra Loan scheme. Date: 30th March 2019, Saturday. Venue: Unispace Business Center, Above Reliance Fresh, Kondapur. Entrepreneur seeking to start preschool in below Rs.1.0 Lakh or above investment. Best Startup Options: Franchise, Cobranding or Own Brand? Preschool challenges in Marketing, Staffing, Academics & Operations. How to launch your start up: opportunity identification and business planning? How to get finance under PM Mudra Loan Scheme to get fund for your start up?